Choosing a new furnace can seem overwhelming, especially if you have never had to replace a furnace in the past. On average, furnaces are designed to last 15 to 20 years, after which parts are more likely to start to fail. There are many brands, efficiencies, new features, warranties, and rebates available. We at Mill City Heating & Cooling want to make your selection of a new furnace as easy as possible. We are well versed in the latest features and efficiencies available on the market, and as trade partners with Xcel and CenterPoint Energy, we know what rebates are available for Minneapolis residents. We provide hassle-free, in-home estimates to help you make the best choice for your home. 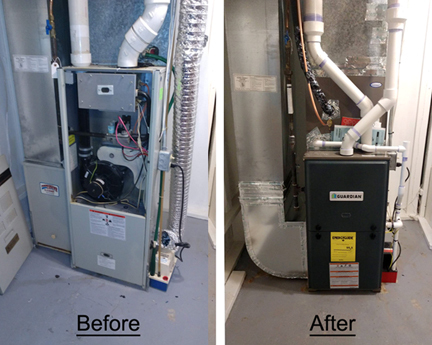 A recent homeowner reached out to us recently for an estimate on a furnace placement in Minneapolis. The previous week he had replaced his blower motor and after it continued to make noise he found out that the entire blower assembly needed to be replaced as well. He chose to have us provide him with a quote for a full system change out as he was unhappy that his renters had to keep dealing with having no heat in the house. We met with him and provided several different options. He chose to replace his entire heating and air conditioning system so he could be worry free for a long time to come.